All the time we see supermarkets opening up in former drug stores, department stores, warehouses, and of course former supermarkets. But I think this is a new one for me. 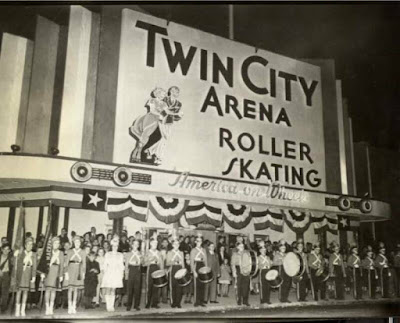 The Twin City Arena in Elizabeth, New Jersey was so named due to its location right on the border of Newark. Read more and see more pictures here and here. The above picture was taken from the first link. Got an idea of the history? Great! Let's check out the supermarket now. Cuban immigrants Alfonso and Myrna Perez came to the US in 1972 and began working in produce distribution, according to Twin City's website. The husband-and-wife team opened their first supermarket, this location in Elizabeth, in 1985. This building also houses their corporate offices, and a building across the parking lot serves as the warehouse for the Twin City group, which now includes two other stores owned by Perez (Twin City Supermarket in Plainfield and Pueblo Supermarket in Newark), an independently-owned Twin City Supermarket in Newark, and the separately-owned Aquí Market chain (with locations at Journal Square and on the Bayonne border in Jersey City and another in Bridgewater). The various Twin City group owners also co-own Superfood Fresh Market in Middlesex. Perez is the president of this group, called Twin City Supermarkets, Inc.
You can see in the photo above that the setting of the store is actually pretty pleasant. 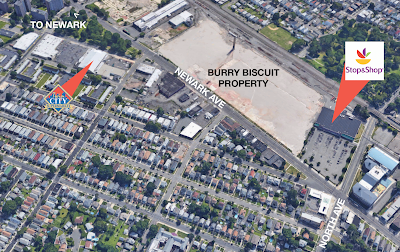 It's located just out of the main intersection, Newark Ave and North Ave, where there is a Stop & Shop. As usual, the photo is from Google Maps. Newark Ave, to the right above, will take you straight to Broad Street in downtown Elizabeth -- or what they now call "Historic Midtown". Give me a break. The Stop & Shop was built as an Edwards Super Food Store in the 1990s, then Stop & Shop opened in the early 2000s. 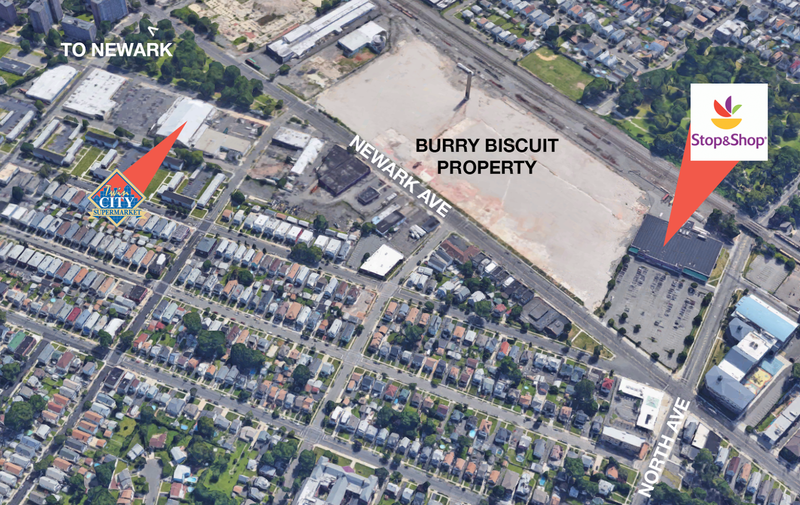 The large empty lot was previously the factory for Burry Biscuit, Burry's Biscuits, or Burry Biscuits, depending on who you ask. This was a huge cookie factory which burned down in 2011. My great-uncle worked here for decades, and when my uncle was in the Marines, my grandmother would go to the Bakery Outlet store across the street to buy damaged cookies that couldn't be sold for very low prices, then send them to him. The property is slated to be redeveloped into a multi-use retail/residential/office complex. A note on the neighborhood: about where the "k" in Newark on my map above is, Newark begins (and continues to the left). Newark Ave becomes Frelinghuysen Ave, which goes towards downtown Newark. I would not recommend visiting this store via Frelinghuysen Ave, as the neighborhood gets progressively worse as you go into Newark. The neighborhood where this store is located, however, is perfectly fine. The park between Twin City and Newark Ave gives it a more peaceful feeling. The roller rink's entrance would have faced Sherman Ave (the side street we're driving on here), but the supermarket's entrance and exit instead face the parking lot. Oh, and ignore that sign that says Discount Store -- Twin City is NOT a discount store! Management and corporate offices are on the second floor, hence the windows. The real storefront faces the parking lot on the side. You see Twin City's delivery vans all over Elizabeth! This sign and the signage facing the parking lot is very new, installed recently to coincide with a renovation inside. I got lucky with a great sky that day! Heading in, you turn right to the produce department, which lines this side wall above. Dairy is along the back wall, with meat, seafood, and deli in the last aisle and checkouts along the front wall (facing Sherman Ave). Past the checkouts is customer service, and a counter with hot food and bakery items. The majority of the store is where the actual roller rink would have been, which is just a big empty room anyway! We'll see some of the adaptations they had to make shortly. Looking along the side wall, the parking lot is to my right. You walk into a bright, open, and extremely clean space with lots of color. In the recent renovations, the walls were painted bright colors, which really livens up the store. The pictures running along the top of the produce cases were also installed. Great signage. I like the wood texture on these. Looking back up towards the entrance, which is to my left. The lower-ceiling area is where the hot food/bakery counter is. Some of the back wall is taken up by more Wall of Values, but there are dairy coolers at the far end. Notice the interesting wall structures to the right here, likely left over from the roller rink. I loved how clean and clear the aisles where. They're extremely long, though! I might have added a center aisle pass-through. A surprisingly large selection of HABA, general merchandise, and housewares is probably due to the fact that there is no general-merchandise store like a dollar store or Walmart -- or even a drugstore -- in this neighborhood. I can't say I've ever seen that one before! Must be something about the building's layout that they couldn't install it into the wall. Or they just couldn't afford it to begin with. The last aisle has the remainder of the dairy cases, then (under the red awning) the deli, meat, and seafood counters. The flooring is kind of crazy here, but in excellent condition. Frozen foods line the opposite side of the last aisle, with a row of coffin cases in front of a row of brand-new upright cases. The front-end is clean, organized, WIDE ENOUGH, and well-staffed (ahem, Acme). 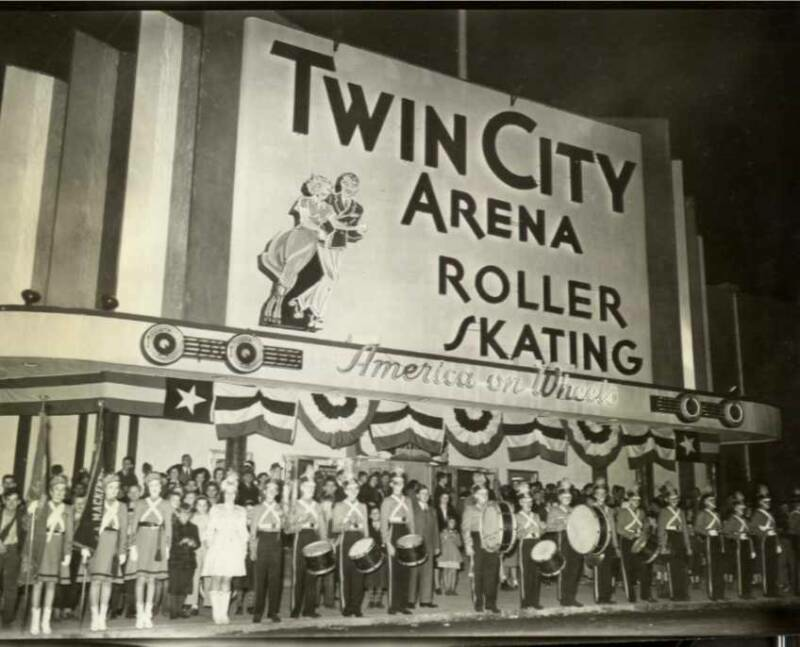 The large window onto the sales floor on the right is likely left over from the roller rink, but is now where the managers' offices are. And speaking of managers, as I was checking out, I realized that standing along the front-end was (now 86-year-old) Alfonso Perez, in his jeans and baseball cap, apparently with nothing else to do on a Saturday evening! Clearly he is well-known and well-liked by everyone around, as he greeted many shoppers who probably live in the neighborhood and know him. Kudos to him...I hope I'm doing as well as he is when I'm 86! To my surprise, every cart in the store was an actual Twin City cart (save for one Stop & Shop one, which made it way across the street at one point or another). The one on the left here is clearly the newer one, but they are actually the same model of cart and all match very well. Twin City Warehouse, I believe, services all of the Twin City group's stores. I've seen these trucks on the road also. The building behind the truck is the warehouse. One last look at the back of the building, which has been recently repainted as well. Stop & Shop opened in the Edwards store fully expecting to crush Twin City and put them out of business within months. Over fifteen years later, that hasn't happened and there's no signs that it will. Why? Well, Twin City is a good operation. They know what they're doing and do it well. But I can assure you this is also a factor: go into a Stop & Shop on a Saturday evening and you will not, I can tell you for a fact, find the president of the company in his jeans and baseball cap greeting customers. Thanks for the research. I was doing a paper respect to Twin City and your previous work help me a lot. I appreciate what are you doing for the supermarkets in the region.